What do your kids call you and your partner? I’m mommy, and my partner is mom-mom, so named by my youngest, a boy. Any humorous anecdotes you can share about explaining different kinds of families or parental relationships to your children? My elder child (a girl) is from a previous partner, and I share parenting responsibilities with my ex. Now both my ex and I are with new partners. So my girl has four moms. Can you imagine parent-teacher conference night with four moms in the room?! It can be overwhelming…. In the early grades at my girl’s school, they always do a family unit. Every year she’s “outed” as coming from a lesbian family. Initially, when she told her friends she had four moms, they couldn’t believe her. For some reason when she told them she had two houses with two moms in each house, the kids were able to understand. I don’t know why. We’re totally normalized on campus now; she’s been attending a school with the same kids since the beginning. We’ve also been extremely fortunate to have teachers unafraid of having those conversations. Can gay people get married in AZ? No, gay marriage is not legal in AZ. In our family, we talk a lot about how families can be made up of different scenarios. Grandparents, single moms, single dads, two dads, two moms, etc. We teach our kids that a family is about love. That’s it, plain and simple. Do you feel it is at all important for your kids to have close male relationships in their life, or is that irrelevant? We feel like they benefit from strong positive people in their lives. Not just us, as their parents. Trusted adults help expand the circle of trust. Uncles and grandparents are huge. We have the granddads. Their uncle is really involved. We surround ourselves with solid, loving people. We do feel it’s important to have strong, male influences in their lives. Our kids have a tremendous sense of family. Never had to have daycare, we’ve been lucky enough to have grammycare. What kind of benefits do heterosexual (married) parents have that lesbian parents don’t have? Everything! In AZ there’s no relationship recognition. The birth parent can give parental rights for six months, and you’re issued a piece of paper with that authorization. It has to be updated every six months. We pay money and have this done, but there’s no real guarantee it will be recognized in the court of law. In most states, when two moms are together, only one of the moms may have parental rights. The birth mother is typically given those rights. For the non-birth mother to have the rights, the birth mother would have to relinquish hers. This piece of paper is the closest thing I have to prove that I’m important in my children’s life. Everyone in our family is supportive of us. I don’t have to worry about my partner’s family taking my kids away from me. This has happened in other places, for example, in regions in the South. The flip side of this is I could bail on my family, but of course I’m not going to do that. I want the protections, and I want to be held accountable to accept the responsibilities as well. Why did you decide to have children, knowing you would not have the rights to them you long to have? I never wanted kids, and didn’t see myself with kids. I didn’t want to give birth; that wasn’t a draw. But, when I met my partner (now my ex), it felt so natural to have a family with her. It was a healthy relationship and we wanted to raise kids. That impetus continued with my current partner. Children brought into gay relationships are not accidents; they are very planned. There are medical procedures involved. Even if you have a friend be a donor, the man has to sign off parental relinquishment. There are fertility issues, and getting eggs harvested (If you go that route). Men have to go through surrogacy or adoption/foster. These routes to building a family take a lot of thought and commitment. Can you adopt your children? No, there is no second parent adoption in AZ. One person can adopt in a same gender relationship, the other parent just can’t. How is being a lesbian parent any different from being a heterosexual parent – from a social-emotional point of view? No difference really. But, when we sent our kids off to school, I’m so much more concerned about the social interactions, then I am about what they learned that day. Bullying will come, and we think about what we’ll need to do. That’s where my pressure and worry comes from. Our children are opened up to a different level of bullying. I had the choice to have them; they didn’t have a choice to come into a family that’s different from their friends. So, as a parent, I feel extra-sensitive about those issues. The thought I might be the reason behind teasing or discomfort is hard on me. We have extra communication with our kids’ teacher, and checking to see if everyone is getting along. So far, it’s great. Our children have not experienced any teasing from kids due to their family dynamic. At worst, one time my daughter heard someone say (3rd or 4th grade) use the word “gay” derogatively, not towards her, but my daughter picked-up on it. She knows not to believe that. We let the teacher know so it was clear that it was not okay. In AZ and wherever you might travel, how does being a lesbian impact the perception of you as a parent? I don’t think it’s that big of deal anymore. I’ve never had a problem. Women tend to be more accepted — since women are believed to be “nurturing” we get a pass. Many of your blog posts have a political spin, how do you, (if you do) pass your political activism on to your children? My daughter knows about Human Rights Campaign – the largest LGBT civil rights organization in which I’m the political co-chair in Arizona. We’re really trying to get more awareness raised about all the different kinds of families that exist in our modern world. Grandparents, same gender parents, single moms and dads, etc., are all raising kids. Gay rights is a key issue in our family, amongst all the other very important political issues. We were invited by Congresswoman Kyrsten Sinema (first openly bi-sexual congressperson) to go to the White House Easter Egg Roll. Our six year old was excited to go to the hunt. 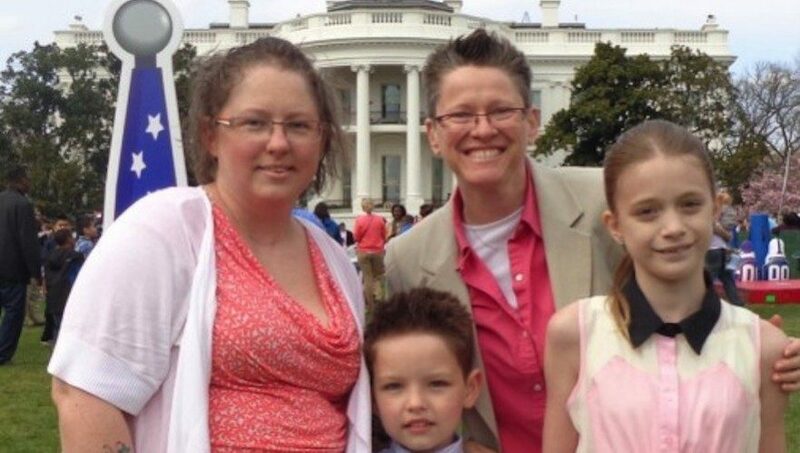 We explained to our eleven year old that the White House wanted gay parents at this event to show their visibility and to honor them. We explained that a family like ours wasn’t invited seven years ago. The extent of my son’s activism came with Romney’s proposed funding cut to PBS – threatening Big Bird’s existence on the air. He wasn’t happy about that. Kathy Young is a popular blogger, and political co-chair of Human Rights Campaign in Arizona. She’s also a c0-host of The Agenda on QTalkAmerica.com. She lives with her partner and two children. I can’t believe 2nd parent adoption isn’t an option. It’s just ridiculous to me that children are left at risk like this. For the security of the child alone (never mind the loving relationship of their moms) 2nd parent adoptions just make sense!